It was sometime early in 1999. 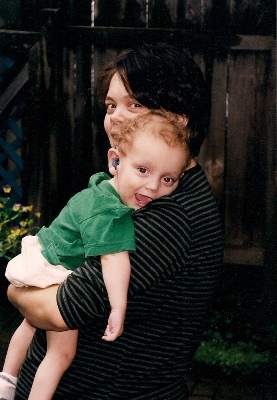 We had recently learned of Owen’s hearing loss and were becoming increasingly uncomfortable with the direction the hospital was taking us–which was straight toward the cochlear implant. Sensing our uneasiness, Owen’s audiologist referred us to Silent Voice (a non-profit agency in Toronto that provides services and programs for the deaf community). I had the very good fortune of speaking to Maureen, who was a Program Coordinator at the time. 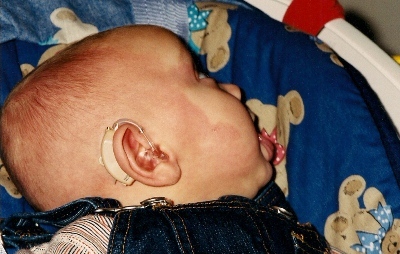 Owen's first hearing aids - 3 months old (corrected). Also, evidence of the large port-wine stain birthmark that eventually faded to become mostly invisible. It was such a quiet, innocent question but still kind of shocking–it jolted me into realizing that Owen’s deafness was not just about me. Interestingly, no one else had asked me that question, despite our exhaustive investigation into services and ‘treatment’ regarding Owen’s hearing loss. Not the physicians, the therapists, the audiologists or the social workers. As with every other medical avenue we pursued, we were instead invited to speak to other parents–and only those whose children had had the anticipated positive medical outcomes. Such big decisions–we considered the g-tube (yes), the cochlear implant (no), the intrathecal baclofen pump (yes), deep brain stimulation (no)–surely meeting an actual recipient of these invasive measures would have been worthwhile? A teen or adult who could articulate what the experience felt like? Or could share how he or she feels about it now? Fashionable blue hearing aids! In this photo I'm pregnant with Angus. Owen is about 20 months old. 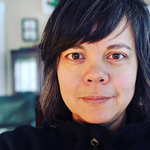 That one simple question–Have you ever met a deaf person?–awakened a new perspective in me, one that stuck with me through the years, if not always consciously. It’s a very sensible question, maybe asked innocently and even naively – but it also demonstrates a foundation of values rooted in humanity. It acknowledges how important it is to connect with others’ experiences and stories. To listen and observe, to ask and wonder. The question says to me, Don’t assume. Pay attention. See for yourself. And be open to possibilities. When I read this, I got chills all over again — fantastic presentation!!! Thank you. It’s amazing how ‘political’ everything is in child disability. Glad to hear about your talk — Silent Voice is an amazing organization. Sometimes the most simple question reveals the most information. Your observation prompted two thoughts. First, the disability rights slogan “nothing about us without us” is spot on. Second, I am often struck when at academic meetings about disability I am routinely the only person with a disability in the room. This is a giant problem. Thanks for your comment Bill. Agree and agree. In terms of parenting: I wonder how many new parents seek out teens or adults with disabilities (for perspective, not necessarily advice) in order to help inform their own choices. I think not many. Any opinions out there on this? To answer your question r.e. parents: None. Not a one.